In my recent Craft & Vision podcast with Jeffrey Saddoris I talked about the ‘gut instinct’ you get when you know you’re doing your own thing. It’s something I believe strongly in and I wanted to share with you a couple of recent examples of what I mean. On the first weekend of June most of the east coast of Queensland and New South Wales were hit by an ‘East Coast Low’, basically a large and powerful weather system carrying a lot of rain and high winds, plus reportedly the biggest swell since 2007. Most of the coast battened down the hatches amid severe weather warnings. The worst of it hit here in Yamba on the Saturday night. Come Sunday things had quietened down a lot, but the seas were still huge and the sky heavy with cloud. I went down to Angourie for a short while to photograph the stormy seas, making a number of images I was happy with. I intended to spend Monday shooting more storm photos. High tide was due about 9am and I wanted to see the extent of the encroaching sea and the possibility of making more photographs in some unusual conditions. However, Monday brought mostly clear skies. The sea was still rough but its intensity had definitely decreased. Under blue skies I was disappointed that the moment for stormy seas under stormy skies had passed; a photograph now might show some of the rough sea but felt altogether too benign for my intention. Here’s a record shot of one of the bigger waves hitting the point, with a few of the distant clouds to the north trying their best to make things a bit murkier. The waves were breaking further out so the bay was filed with mostly white water. I would later look for better waves in more promising locations to photograph. For now I found myself drawn to the tidal pool. 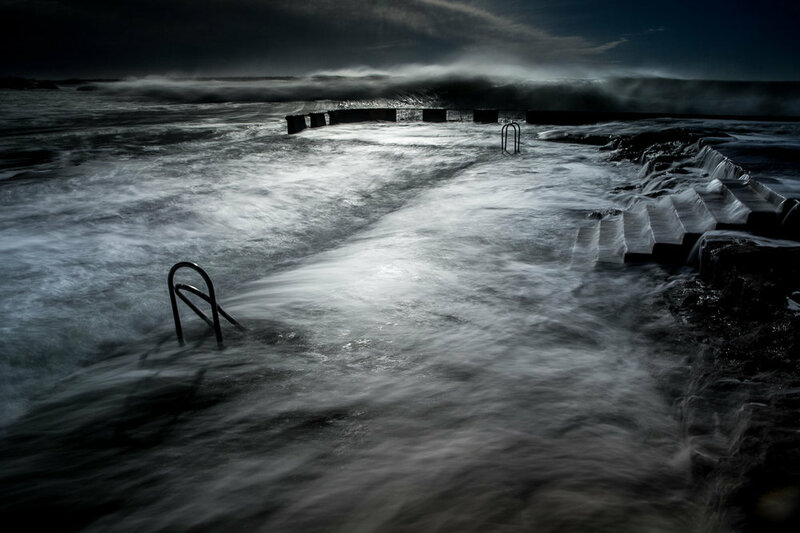 With the tide right over the top of it I became drawn to the contrast between the water and the part submerged handrails, bent and broken from the large logs and rocks tossed at them by the storm. I started out with wider shots, hoping for something speaking of 'the pool in a storm’. But the hand rails drew me in ever closer. I noticed the movement of the white water and spume (foam) in the pool as each wave came over. 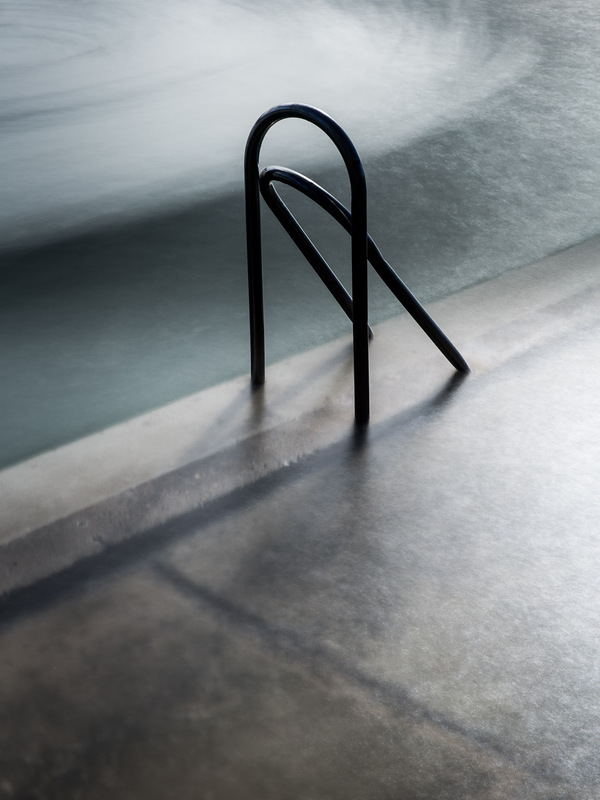 Over the course of 45 minutes I continued to narrow my focus and vision onto these bent handrails until eventually my favourite shot was of the dark and broken rails with the added geometry from the submerged poolside on a backdrop of water. There were several moments in those 45 minutes that I thought “Hold on, you came to shoot stormy seas and you’re now doing some semi-abstract long exposure thing that - bent rail aside - speaks nothing of the storm. What on earth are you doing?”. And the answer was that I was just going with my gut instinct. There were already stormy sea shots all over the news and social media, so nobody - least of all me - was interested in some more stormy seas in what was actually t-shirt weather. There wasn’t much drama to be had here, and I’m not a documentary photographer anyway. I was here to find what interested me and photograph that. I just allowed myself to go with the flow and continue to focus on the hand rails. Now, yes, there are no shortage of long exposure photographs of objects protruding from long exposure water. I’m sure handrails probably feature prominently in those photographs too! But right there, in that moment, I was just photographing what I found interesting, not thinking about what had gone before, about being creative or original, or what the outcome would be. If anyone would like them, or if they would be shots I would display proudly. I was just following my own instinct, running down my own rabbit hole. That’s what I consider to be ‘following your own path’. I had conspired against myself to shoot something so completely different to my intended subject, the obvious subject, the newsworthy subject, to make what I’m sure a lot of people will find a boring photograph of a twisted pool handrail. I don’t think creativity is too bothered about making the most dramatic image, just the one that speaks the calls to you at the time. The other example I’d like to share with you came the following day. Again the skies were pretty clear but the swell was impressive. I decided to go to Angourie again to make some more of my wave ‘portraits' (you can see some examples here). Arriving at the Blue Pools’ car park I was surprised at how busy the car park was, such that I was lucky to find a parking space. As I approached the rocks I found a good crowd of people including quite a number of photographers with long lenses pointing towards what seemed like a couple of dozen surfers on the large waves just off the point. One surfer told me he hadn’t seen the surf as good for about 10 years. I visit this spot often and I’m usually the only one there, maybe with a surfer or two in the water but otherwise I have it all to myself. Working with a big crowd to my back was quite unnerving! Clearly the ‘go to shot’ here was sharp, highly detailed photographs of the surfers weaving their magic through these seemingly monster waves. That’s not really my thing, but I took a few before the rabbit hole opened up before me once again. My wave portraits are often shot between 1/10 and 1/40 shutter speeds to intentionally blur the water; I love the lines, shapes and textures that this reveals in a wave. Rather than going for the ‘surf magazine’ shot I felt my creative instinct tugging at me to do my own thing, but try it with the addition of the surfers to add an extra sense of scale and interest to the wave portrait. So here I am, standing in front of a large crowd including several photographers with big long white lenses, and I’m waggling my camera from side-to-side with several ND filters on the front and the tell tale ‘kah-clunk’ of a slow shutter speed. During brief moments of self-consciousness I could hear the voice of the other photographers in my head, “What the hell is that guy doing? He’s not going to get any sharp photos doing that. Damn newbie, all the gear, no idea!”. I carried on regardless, playing with my shutter speeds, panning with the surfers, swapping filters in and out, understanding how the momentary cloud was changing the light, trying to get the same feel as my wave portraits but with a relatively sharp surfer riding the wave. 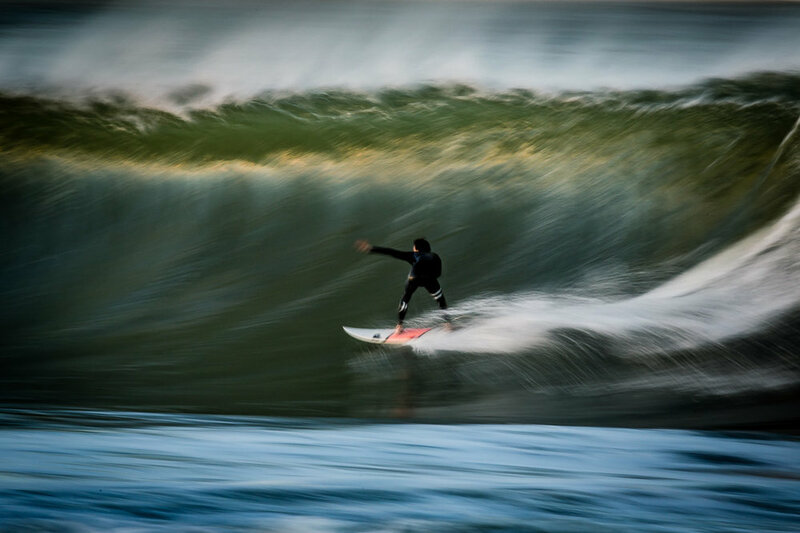 So here I am photographing the best waves in a decade, with dozens of surfers to shoot, and yet I’m just doing this same blurry photography thing because that’s the rabbit hole I find myself instinctively diving down. Ye, I could have disciplined myself to shooting the surfers with a high shutter speed with perhaps a more marketable result. 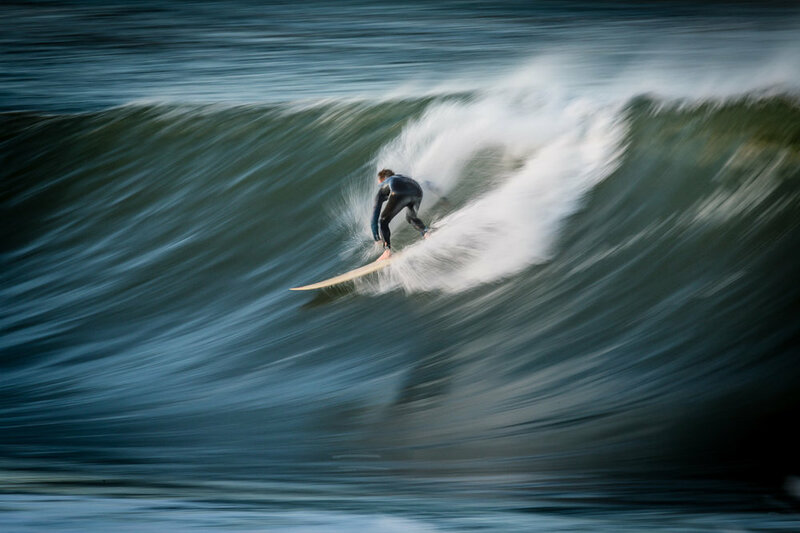 But there’s no shortage of great surf photographs out there (I think of the great work by the likes of Russell Ord, great watermen as well as great photographers; infinitely better placed than I to take such photos). 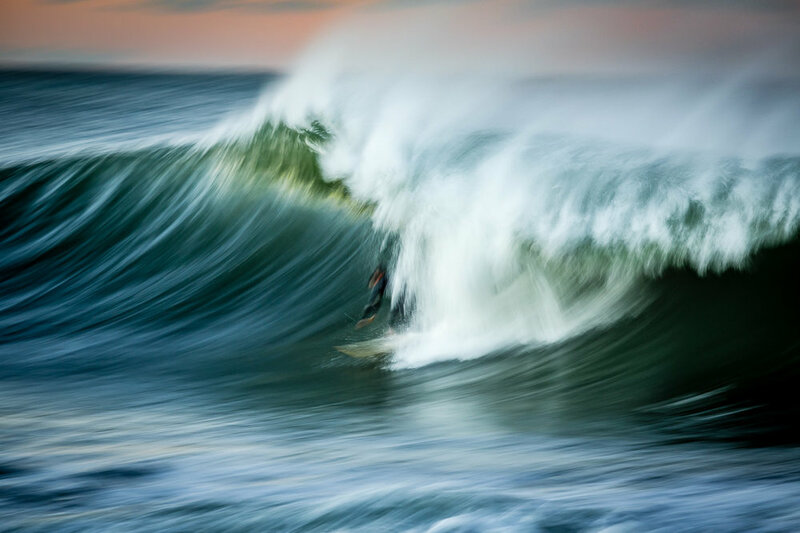 I remember chatting to Neil Mansfield about surf photography; I have neither the water skills, surfing knowledge or photography experience in that environment to make the best photographs of that particular genre. I see no point in me trying to do that when I find myself interested in exploring it differently, a different aesthetic and style that appeals to me on a personal level. Now, I’m not saying all of this to say “how amazingly different am I?” because, really, I’m not. A long exposure hand rail and some blurry surfers are not by themselves anything special. Quite the contrary. In fact I'm a really bad digger, or at least rabbit hole spotter. But increasingly when I see one, or sense one, I tell myself to go down it. So what I am saying is that I found myself curious and interested in something different to what I intended or expected myself to produce, and just went with it. 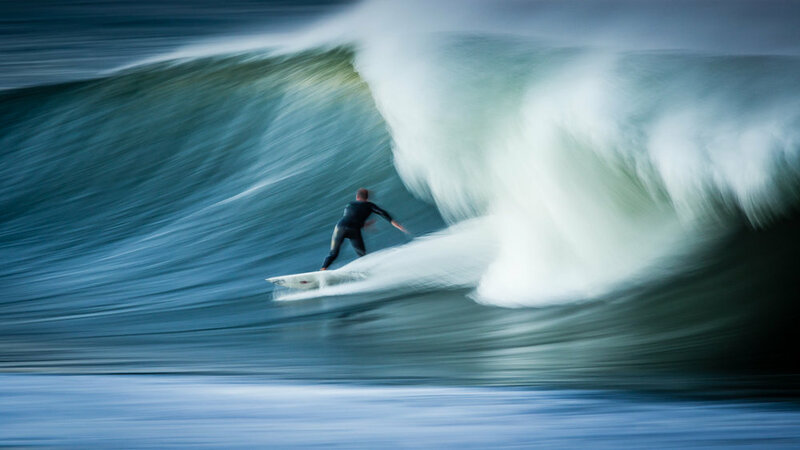 Other photographers might get that same feeling which leads them to make amazing photos of storm waves pounding cliffs, or insanely sharp shots of surfers as they ride through the barrel of a wave. That’s their particular rabbit hole, and they need to dive down that just as much as I need to dive down mine. It’s important to listen to those little voices in your head, or that feeling in your gut, or however ideas speak to you, that says “this intrigues me, what if I…?”. That’s your creativity talking. The point isn’t to make original photographs but to make authentic photos - the photos with your own stamp on them, that spring from your own mind and ideas. I think this is how your photographs speak to other people; they see how you think, see, and feel and communicate that in a photograph. The goal isn’t to be popular, but to express yourself through the ideas that you have, and hope that your voice finds the people who want to listen. So next time you hear the voice in your head and see a hole appear at your feet, jump in and see what you find.